With Facebook Live you can use your phone to share a moment instantly with the people you care about. This means your friends, family or fans can be there with you, and you can respond to their comments and see their reactions. Since launching Facebook Live last summer to public figures via our Mentions app and more recently to everyone in the US using our iOS and Android apps we’ve been surprised and delighted with how people are using live video to connect and interact with each other all over the world. People are letting their friends discover their hobbies. Parents are using it to share moments in their kids’ lives with their extended families. Athletes are giving people a window into their training. Chefs are bringing their fans into their kitchen. Journalists are hosting global conversations on topics they care about. Aspiring musicians can now put on a live concert for their friends. Many people all over the world are using Facebook Live in many different ways to talk to and interact with the people that matter most to them. Introducing New Ways to Create, Share and Discover Live Video on Facebook from Facebook on Vimeo. That’s why Facebook announces new features for Facebook Live to give you more ways to discover, share, and interact with live video, and more ways to personalize your live broadcasts. “Going live” on Facebook feels special because you are going live with the people you care about. Today the social networking site is rolling out the ability to go live in Facebook Groups and Facebook Events,” says the company in a blog post. Live in Groups allows you to broadcast to just the people in the Facebook Group – so you can go live in your family group, or share a workout plan in a fitness group. Live in Events means you can go live from a birthday party to allow those that can’t make it to join the fun, and a performer can go live backstage to the people who’ve RSVP-ed to the event to give them a sneak peak. You can even use Events to schedule a live Q&A session. We hope this new ability to both broadcast and watch live video within Groups and Events enables people to connect more deeply with their closest friends, family and the communities of people who share their interests. 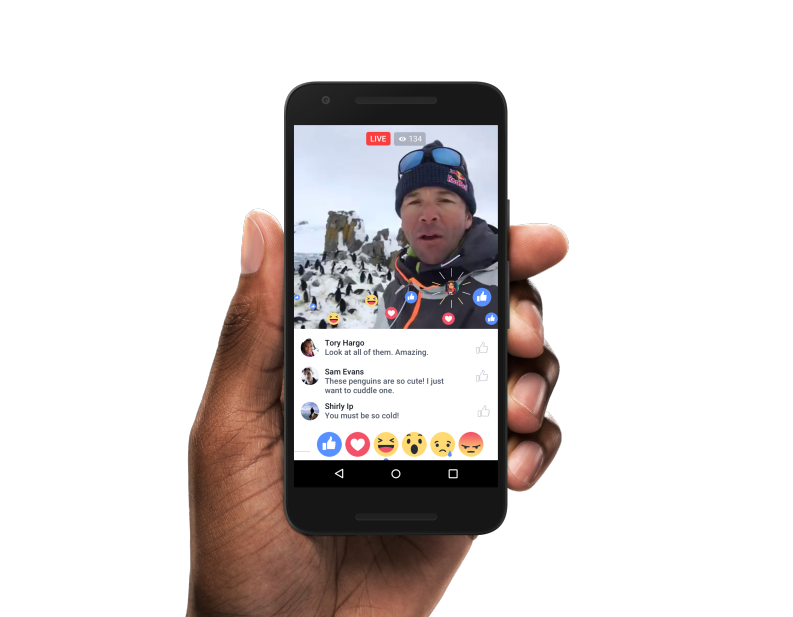 Facebook Live is interactive and fun: Live reactions, replaying comments made while live and Live filters will make it even more so. Live Reactions makes it easy for your viewers to express their feelings in real time during a live broadcast. Using the same reactions we launched in News Feed, viewers can select Love, Haha, Wow, Sad or Angry, and the reactions animate right on top of the video. Live Reactions appear in real time and disappear quickly so broadcasters and other viewers can get a sense of how people are feeling at different points during the live video – it’s like hearing the crowd applaud and cheer. When your friend reacts to your video or to a video you are both watching together you’ll see their profile pic and a little starburst before their reaction appears. Live video feature is truly interactive as broadcasters engage with their commenters and respond to their suggestions and questions. In fact, from initial data, we’ve seen that people comment more than 10 times more on Facebook Live videos than on regular videos. We want people watching the broadcast after the fact to feel “in” on the action. To achieve this, we will replay comments as they happened during the live broadcast when people watch it later. We’ve also heard that people want more creative ways to personalize their live broadcasts. Today we’re starting with a set of five Live Filters, and coming soon we’ll add the ability to draw or doodle on your video while live. People are having a lot of fun watching live with friends. That’s why today Facebook has also decided to add the option to send an invitation to a friend to watch with you right from the live video. Simply tap on the invite icon and select the friend you want to invite and they will receive a push notification with your invitation. People don’t want to miss out on great broadcasts that are live right now. So today, Facebook is starting to roll out a dedicated place on Facebook’s mobile app where you can discover live video that the world is talking about, live video from the friends and creators that matter most to you, and live video on topics you’re interested in. From that place, you can also search live and non-live videos, and choose to go live yourself. Simply tap on the new video icon in the app to navigate to this new space. Finally, if you want a visual way to explore public live broadcasts that Facebook currently happening around the world, today we’re releasing a Facebook Live Map on a desktop. People in more than 60 countries can now share live video, and we’ve been inspired by all the different global broadcasts. The Facebook Live Map gives you a window into what’s happening in the world right now. We’re also introducing new metrics for Pages sharing live video; read more on our Media blog. We’ve been humbled by all the amazing and creative ways that people have used Facebook Live so far, and we’re committed to creating the best experience for everyone who wants to create, watch and interact with live videos on Facebook. These features will be rolling out on iOS and Android over the coming weeks. We’ll keep working to bring you the best ways to broadcast, interact with, and discover live video. Stay tuned.